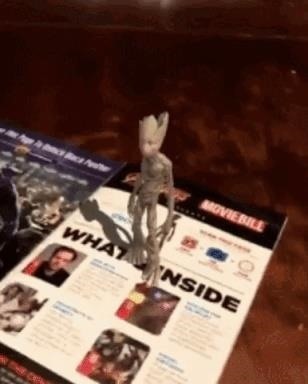 Riding the coattails of one of the biggest movies this year, the first edition of the new Moviebill augmented reality magazine will be available at Regal Cinema theaters nationwide this weekend alongside the release Avengers: Infinity War. Moviegoers will be able to scan the cover and pages within the magazine with the Regal Cinemas mobile app for iOS and Android to reveal AR content. 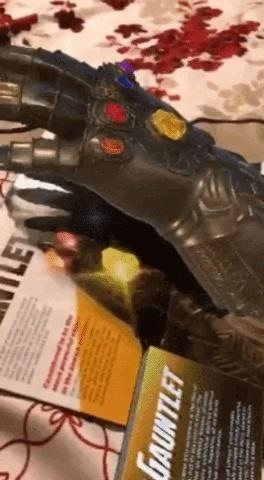 Scanning the cover uncovers 3D models of Marvel cinematic universe characters Iron Man and Thanos (the interstellar villain who has been lurking behind the scenes since the first Avengers movie). The duo appears frozen in battle (see top image). 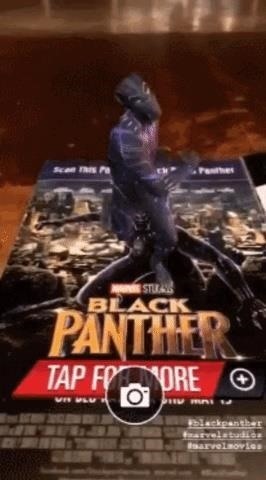 Based on social media posts from Moviebill and Regal Cinema theater customers, Marvel characters Black Panther and Groot (who, unlike Iron Man and Thanos, are animated and accompanied by sound effects) also make appearances in the debut issue, along with other movie-related content. "We're working closely with Marvel Studios and Disney to ensure the edition is a true deep dive into the film," said Matthew Shreder and James Andrew Felts, the founders of Moviebill, in a statement. "Consumers are the kings and queens, and fans are hungrier than ever for Avengers content. It's an honor to be launching with the biggest and most exciting franchise in today's entertainment marketplace." Anyone who attends Avengers: Infinity War at Regal Cinema theaters will receive Moviebill for free, with more than one million copies being distributed between locations nationwide. "Regal is proud to bring another innovation to the cinema experience by partnering with Moviebill and introducing this AR technology to the masses," said Ken Thewes, the chief marketing officer at Regal Entertainment Group. "By focusing on the customer, we continue to find new innovations and partnerships that enhance the overall Regal moviegoing experience for our guests." The AR experiences come courtesy of National CineMedia (NCM), which, earlier this year, announced its involvement with the publication in conjunction with its launch of Noovie AR, an app that enables AR games activated by content in the pre-show reel and lobby advertisements at participating theaters. "NCM and Moviebill are working with advertisers to create custom activations that have full augmented reality capabilities within the Moviebill platform," said Ian Owen-Ward, executive vice president of brand partnerships at Moviebill, in the previous announcement. "With a seven-figure circulation commitment per edition, Moviebill will be one of the most highly circulated physical entertainment media outlets at launch to an audience of highly-desirable moviegoers." On the advertising front, the magazine also features embedded videos for upcoming movies, including Deadpool 2. Just as the publishing industry has latched onto AR to revive a struggling business model threatened by technology, movie theaters are now looking to AR to engage audiences and add value for advertisers. So far, movie theaters and AR appear to be a great match.